Made entirely of steel with a tubular head applied with six strongly cusped flanges, each pierced with a trefoil and cut at its lower end with two decorative projections, a conical finial cut with a central rosette within a circle of radiating notches on a molded base, a hexagonal haft decorated distally with cabled moldings, and along its angles with cabled ribs, and a leather-covered tubular grip fitted in front of the hand with an octagonal roundel, and behind it with an octagonal cap cut with a central rosette within a circle of radiating notches, retaining traces of original gilding. The claim of Chaucer's late 14th century Knight that "with mighty maces" bones were shattered, is not to be lightly dismissed as mere poetic exaggeration: the mace was clearly a formidable weapon. It is perhaps no coincidence that its rise in popularity followed closely upon the introduction of plate armour, against which its crushing blows must have been particularly effective. 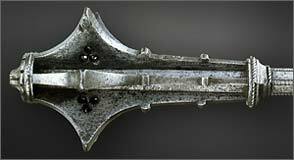 In the late 13th and early 14th century the mace usually possessed a wooden haft, and a head that was made either of bronze, cast and chased with projecting bosses, or of iron, forged and cut with longitudinal grooves. Early in the 14th century, however, a new version with a flanged head and a metal haft came into use, eventually to supplant the others. It reached the high point of its development in the beautifully proportioned "Gothic" maces of the latter part of the 15th century. As the present superb example shows, their molded hafts and cusped and fretted heads tended to imitate on a smaller scale the slender columns and delicate tracery that were a part of the architectural repertoire of the period. This tendency is seen at its most extreme in two elaborately decorated gilt brass maces in the Hafjagd- und Rustkammer, Vienna, made for the Emperor Friedrich III and his son, the Archduke, later Emperor, Maximilian I in about 1474. Interestingly, their grips unscrew to receive, in one case, small gaming-boards for chess and trick-¬track, and in the other, a sundial with a compass; presumably reflecting the tastes of Friedrich III as an ardent chess-player and student of mathematics and astronomy. The present example, like others of its kind preserved in the Cleveland Museum of Art, the Royal Armouries Museum, Leeds, the Wallace Collection, London, and the Fitzwilliam Museum, Cambridge, was clearly intended to be used in earnest. Oh, my! I may have to break out of my 1500-1650 bubble and pick up one of these late Gothic maces after all! The weapon just doesn't get any prettier than in this period, and these are wonderful examples. Thanks! Here's a whole site dedicated to maces, with photos revealing construction, form, etc. Oh, great ......... now I'm thinking of maybe getting one. Wow, Nathan. You just keep coming up with really cool stuff. That mace is beauty for sure. Thanks for sharing pics of things I would never have the chance to see otherwise! Wouldn't mind adding something like that to a collection my own self, hehe. I really like those weapon profiles - very informative and interesting. Especially the Black-Sallet thread caught my attention. My thanks to Nathan Robinson!